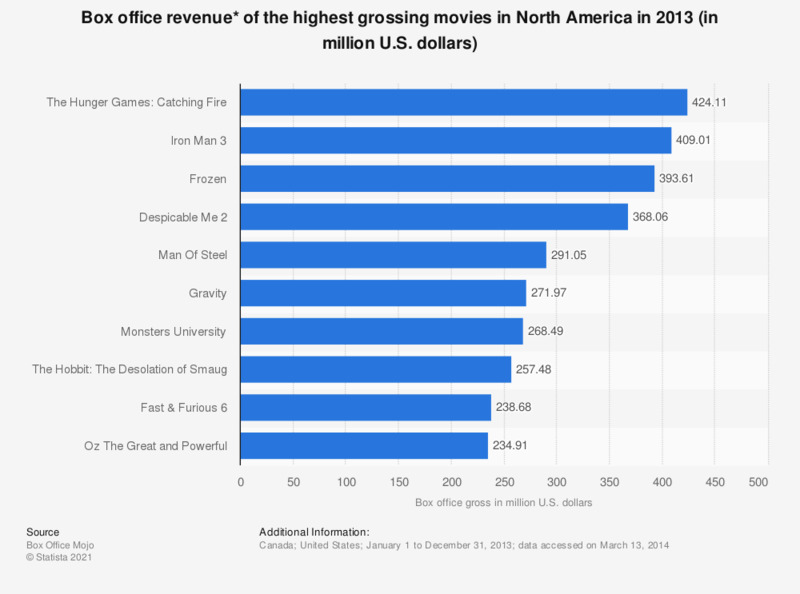 The statistic above presents the most successful movies at the North American box office in 2013. Shane Black's "Iron Man 3" ranked second, with 409.01 million US dollars box office revenue collected from 4,253 movie theaters across North America. Here you can find information on the highest grossing movies of 2014. The most successful film of the year was the second installment of The Hunger Games trilogy, “Catching Fire,” despite being released in late November 2013. From then until the end of the year, the movie generated 424.11 million U.S. dollars box office revenue in North America; the movie’s lifetime global gross more than doubles that figure, amounting to 864.57 million dollars. The first installment (released in March 2012), simply titled “The Hunger Games,” generated 408 million U.S. dollars in North America and was the third bestselling movie of 2012. Its worldwide revenue amounted to 691.25 million dollars. The movies are based on books written by Suzanne Collins. The first part was published in 2008, with the other two following in 2009 and 2010, respectively. In 2010, the trilogy sold 4.3 million copies in the United States, the figure more than doubled in 2011, reaching 9.2 million. After the first movie was released in March 2012, sales boomed in 2012 with a result of 27.7 million copies sold across the U.S. A year later, when the hype passed, unit sales dropped to 3.3 million. Before Suzanne Collins wrote The Hunger Games, she published a series of five fantasy novels, “The Underland Chronicles,” about an underground city hidden under the streets of New York.